I know I am not alone when I say that I am thrilled to have football back in my life. The last week has been great with all of the additions and subtractions teams have been making. I want to take a look at the AFC East and get you all up to speed on winners and losers within the division. Bellichik is at it again! The signing of Albert Haynesworth and the acquisition of Chad Ochocinco are two great moves. They address two major needs for this team and provide proven producers that seem to be already buying into “the patriot way”. Don’t underestimate the importance of the resigning of mainstay Matt Light along the Pats offensive line. Bringing back Light allows them to develop Solder and also allows him to learn from a guy who they hope he will eclipse in the very short future. The only problem I have with the past week forNew England is that they haven’t addressed the pass rushing need enough in my opinion. Relying on a total rebirth of Big Al (that’s what I’m calling him) is a l ot to ask for given his recent “transgressions” and I expect them to continue to turn over rocks to find another pass rusher. They brought in Matt Roth for a workout who is a former Brown and Dolphin who I believe would be another solid signing for them. The law firm has also been resigned and they could benefit by bringing in another back however their lack of movement leads me to believe they are going to give the draft picks a shot. Let’s not forget this team was 14-2 last year and it has improved its roster by a good amount. Dare I say they are on the right track? This is a young team that is still trying to find its identity. They made the transition from being a 4-3 defense to implementing the 3-4 (a good move). The personnel on the team was still a mix of guys that were either tweeners or didn’t fit. They bring in nick Barnett off of a season ending injury who is only two years removed from being a top 3 inside linebacker according to pro football focus. They retained talented corner Drayton Florence and also signed former wide receiver/kick returner (he is listed as a QB on the depth chart) Brad Smith from the Jets. Gailey also brought in Tyler Thigpen from the Dolphins whom he had while he was in KC and who was the 15th best QB (again according to pro football focus) in 2009. Are they there yet? Absolutely not, but they WILL win some games they aren’t supposed to this season. Rex Ryan is never short on words and just recently he pleaded with the league for another team to beat the Patriots besides the Jets. I have a question for you Rex, who have you beaten in free agency? 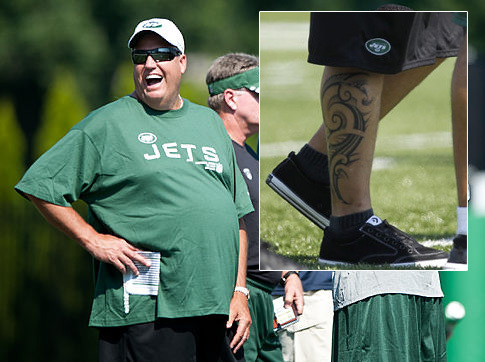 The answer to that would be very few teams, oh and your shin tattoo is gay….super gay. Resigning Santonio Holmes was no doubt crucial however you didn’t add any depth on the again over rated defensive line (I think the rookie DT they drafted is over rated) and your big move is Plaxico? Without a workout they have committed 3 million to a guy years removed form the NFL who wasn’t fast to begin with, and is a wrong club venue away from another suspension. On the other hand you let go Braylon Edward, another high character guy, who has proven to come up big in the playoffs the last two seasons for you. I’m sorry but I can’t give the Jets a great rating here. The Dolphins have been pretty busy in free agency and I want to preface this by stating that they actually addressed positions of need. However this rating will not be good for them. They cut Channing Crowder who was a one dimensional run stopper and could not play on 3rd down with Kevin Burnett fromSan Diego. Burnett is a very solid signing who is above average in coverage and has an all around better game than Crowder so an upgrade to an already strong defense. The next need for this time was help on the interior line. They drafted Pouncey who will start at Center and has impressed in camp so far. They have recently signed formerBostonCollege standout Marc Colombo.Colombo is coming off a rough year last year from injury but has worked with Dolphins coach Sparano before. Vernon Carey (starting RT last 7 years) will move inside to RG and fulfill yet another need forMiami. The team needed more speed so they drafted Edmund Gates and traded for Reggie Bush. Gates will mostly be a special teams player returning punts and have a deep route here and there. Bush is supposed to be “the guy”? This baffles me and while I fully anticipate rookie Daniel Thomas to develop into a solid running back, I don’t expect Bush to be the guy because quite frankly, he never has been. So why did they lose in my opinion you ask? They STILL do not have a quarterback. Balking on the Kyle Orton trade has the fan base chanting for him while Henne stinks it up at Dolphins practices. The team brought in Matt Moore, which would be the equivalent of trying to get revenge at your girlfriend by taking out a girl with a deformity. This my friends is no an upgrade. So while the Dolphins have improved in need positions, it is a quarterback driven league and they have done nothing.